Innovating and trending isn’t something new for Anirudh. After all that was exactly how he rose to fame through “Why This Kolaveri”. He gave us something different, it trended and became viral. After establishing himself as a household name in Kollywood & Tamil Music, Rockstar Anirudh has decided to venture into Hindi songs. He has set his mind on coming up with something trendy. 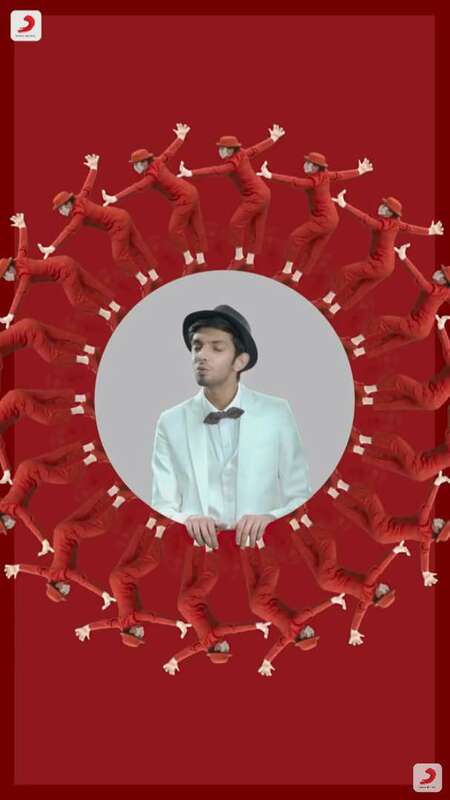 Joining hands with Sony Music, Anirudh Ravichander has released a Hindi track titled “Bewajah”. As I don’t speak Hindi, I had to ask my friends what does “Bewajah” means. According to my panel of expert Hindi speaking friends, the term “Bewajah” means “without any reason”. As amazing as the song turned out to be, what has gotten people talking is the music video. “Bewajah” is India’s very first VERTICAL MUSIC VIDEO. 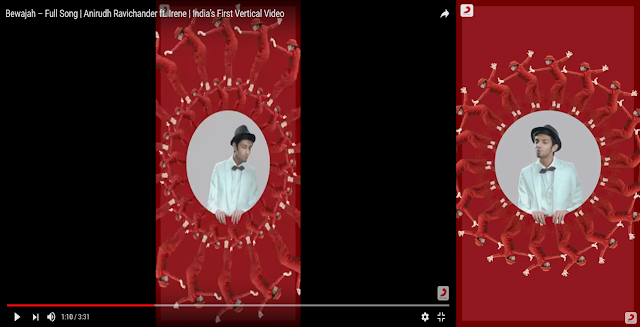 Well to help you understand a little better, below is a comparison of a normal music video and a vertical music video. A vertical music video when watched on your tablet or smartphone utilizes your whole screen without needing you to turn your device into a horizontal position. It gives the viewers a much more engaging experience. With statistic showing that smartphone users hold their device vertically 94% of the time, Anirudh & Sony Music might have just unlocked the next big thing in music videos and won massively through “Bewajah”. As quoted by Anirudh, this is what he has to say about India’s 1st Vertical Video. Coming down to the music video itself, being a vertical video isn’t the only unique thing about “Bewajah”. The concept of how the music video itself being done is indeed unique. If I were to sum it up, the music video uses a theme of classic movie poster coming to life in a 3-D like feel with the song lyrics hovering over just like the movie poster tittle. The music video felt very colorful and together with the tune of the music keeps you very much engages. And then comes Anirudh during the chorus portion looking ever so classy spotting a white suit, a bow tie and a hat while riding a bicycle, pooping out and singing along the chorus. It is a music video that has the ability to take you back through time and just feel the beauty and class of the song. Well done once again to Anirudh & Sony Music for coming up with something innovative, creative and engaging. I have no doubts that this song is going to be topping the music charts very soon and go viral among music lovers. There is also something exciting news Sony Music has to offer to Malaysian music lovers. Sony Music India is going to be working closely with Sony Music Malaysia to ensure that Malaysian Tamil and Hindi music lovers will be getting their favourite contents without any delay. Stay tuned to Sony Music Malaysia is going to be doing something exciting for all of you through their brand new social media platforms and Boggler Blogger takes immense pride to announce this to you. Note:Applicants must be 18years and above and must possess a good personality. A night with your mummy is Rm4,000 when you are able to satisfy your mummy emotionally. CONTACT US VIA EMAIL: malaysiasugarmummyhookupagency@gmail.com for urgent connection or CONTACT US VIA WhatsApp : +601139660369. you have all it takes to make a lady happy on bed?.).+601126122958. SAY NO TO FAKE AGENT OF SUGAR MUMMY LET PUT AN END TO DOES FRAUDULENT AGENT HELLO FELLOW MALAYSIANS I want to use this medium to thank and appreciate Mrs Rania for a successful job well done by connecting me to a rich and wealthy sugar Mummy and daddy who happen to become my sugar mummy I never thought there are still true and reliable agent who can connect me because i have been cheated so many times by fake agent who claims to be an agent of sugar mummy and daddy hookup some of them even claim to work for the Asia dating venture. I spent little money but I never regretted because I got what I was looking for and right now am with her. She payed me for the first night as agreed and she has been the one taking good care of me. Am so so happy and glad of having her. Am proud of her ALLAH bless the day I knew Mrs Rania and Allah bless you all for reading my message you can contact Mrs Rania via the same whatsapp number +601128518673 Please be wear of fraudsters because many of them claim to be Mrs Rania, the only Mrs Rania I know uses only one whatsapp phone number Which is .+601128518673 I wish you success in all what you are doing fellow Malaysians help me say a big thanks to Mrs Rania and I will continue to testify your good work ANYWHERE I GO IN THIS WORLD. GO ON WITH YOUR GOOD WORK.The only money i pay to hookup as registration fees is 600rm only. NO HIDDEN FEES AGAIN!!! SAY NO TO FAKE AGENT OF SUGAR MUMMY LET PUT AN END TO THOSE FRAUDULENT AGENT HELLO FELLOW MALAYSIANS I want to use this medium to thank and appreciate Mrs Rania for a successful job well done by connecting me to a rich and wealthy sugar Mummy and daddy who happen to become my sugar mummy I never thought there are still true and reliable agent who can connect me because i have been cheated so many times by fake agent who claims to be an agent of sugar mummy and daddy hookup some of them even claim to work for the Asia dating venture. I spent little money but I never regretted because I got what I was looking for and right now am with her. She payed me for the first night as agreed and she has been the one taking good care of me. Am so so happy and glad of having her. Am proud of her ALLAH bless the day I knew Mrs Rania and Allah bless you all for reading my message you can contact Mrs Rania via the same whatsapp number +601128518673 Please be wear of fraudsters because many of them claim to be Mrs Rania, the only Mrs Rania I know uses only one whatsapp phone number Which is .+601128518673 I wish you success in all what you are doing fellow Malaysians help me say a big thanks to Mrs Rania and I will continue to testify your good work ANYWHERE I GO IN THIS WORLD. GO ON WITH YOUR GOOD WORK.The only money i pay to hookup as registration fees is 600rm only. NO HIDDEN FEES AGAIN!! !